EPAC is the European Public Art Centre. 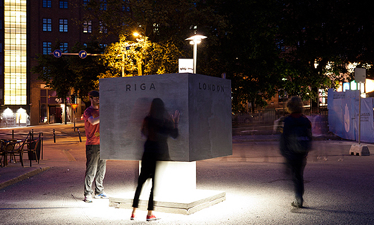 It is a collaborative engagement between organisations across eight European countries, with the aim to exhibit art&science artworks in urban outdoor public settings, in which the Finnish Society of Bioart is the Finnish partner. For EPAC the work CityBeat by artists Ben Dromey and Mina Arko was selected and produced by Piritta Puhto. CityBeat brings the heartbeats of Riga, Lisbon, London and Helsinki for us to touch, comparing the changing pace of the cities. Live recorded sound in central places in these cities is translated into a heartbeat, and one is able to feel and compare the changing pace of the cities by touching the installation, bringing back into focus what a city is: an organism created, inhabited and continuously changed by humans. As part of the EPAC also Anne Brodies´ Bee Box opened at Lasipalatsi square. A swarm of bees going nowhere, pollinating nothing. Bee societies face many of the problems faced by human society, including maintaining public health, organising efficient information and transport systems and maintaining harmony in the group. This work relates to the increasing tensions in both societies and questions when the harmony is brought under threat.